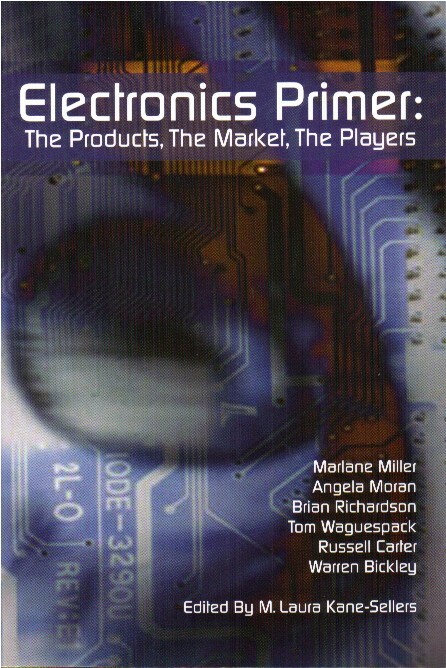 Created by a faculty and student team for industry, educators, and students, Electronics Primer: The Products, The Markets, The Players provides an expert overview of the electronic component industry and key facts on electronic components at a glance. Phoenix, Arizona– CorePurpose Publishing today announced the release of Electronics Primer: The Products, The Markets, The Players (Electronics Primer) a new handbook that provides a comprehensive overview of the electronics components that form the building blocks of the global electronics industry. The book is authored by a collaborative student team from Texas A&M University and edited by Texas A&M faculty member M. Laura Kane-Sellers who also holds the office of Education Foundation Director of the NEDA. Publication of Electronics Primer was underwritten by a grant from the NEDA Education Foundation, which is affiliated with the National Electronic Distributors Association (NEDA). Leading electronics industry executives are also acknowledging that Electronics Primer fills a gap that has existed in the tools available for employee training. Electronics Primer can be ordered through the National Electronics Distributor Association at www.NEDAssoc.org and at www.CorePurpose.com. Electronics Primer is a comprehensive non-technical guide to the electronics industry. It offers product descriptions, features and benefits and the life cycle of a wide variety of components: semiconductors, active discrete and passive electromechanical interconnects. The Primer also provides company names, websites, revenue, and market share information. • Defines all products in the specific product group in a non-technical, simplified way. Also, this section answers questions such as how customers use the product and what problems the product solves. • Life Cycle Stages of a life cycle are explained in each product area and product families are positioned on a life cycle curve. • Identify key Manufacturers, Distributors, and Suppliers Worldwide and Regional Total Available Market (TAM) Distributor Total Available Market (DTAM) and Market Segmentation. M. Laura Kane-Sellers, MA, MBA is a full-time faculty member at Texas A&M University in the Industrial Distribution Program. In addition to her responsibilities at TAMU, Laurie serves as Education Foundation Director for the National Electronic Distributors Association (NEDA). She worked in the electronics industry for 20 years prior to pursuing her Ph.D. at TAMU. Having completed all Ph.D. coursework in Education Human Resource Development with a minor in Industrial Distribution is scheduled to complete her dissertation by December 2005. Laurie also holds two master’s degrees: one in Business from Southern Methodist University, and the other in Speech Communications from Texas Tech University. Laurie is co-author of Connecting Resources: A Primer for Electronics Distribution published in 2004. She is currently working on a book titled Painting the Homeless Visible and Giving them a Voice scheduled for release in 2006. Marlane Miller is a Senior Industrial Distribution student at Texas A&M University, class of 2005. She will graduate in December of 2005 with a bachelor’s of science degree in Industrial Distribution along with a minor in Business. Marlane is at present seeking a job in the electronics industry with plans to obtain an MBA in the future. Angela Moran is from Dallas, Texas, and a graduate of the Texas A&M Class of 2004. She majored in Industrial Distribution with a minor in Mathematics. Currently, Angela is observing in the Dallas Independent School District to complete her secondary teacher certification. After this, she plans to obtain a master’s degree. Brian Richardson was born and raised in San Antonio, Texas. Brian graduates in December of 2005 with a bachelor’s of science degree in Industrial Distribution from Texas A&M University. He is currently searching for a job in the electronics industry and looks forward to marrying his high school sweetheart in March of 2006. Tom Waguespack is a May 2005 graduate of the Texas A&M University Industrial Distribution Program. He is currently an Account Manager for TTI, Inc., an industry leading distributor of passive, interconnect, and electromechanical components. Tom was born and raised in Houston, Texas. Russell Carter grew up in Houston, Texas, and attended Texas A&M University studying Industrial Distribution. Russell found his niche in the electronics field and was inducted into the Sigma Delta honor society. He graduated in May 2005 and accepted a job with Texas Instruments in Dallas, Texas, where he is responsible for capacity/business planning for worldwide manufacturing of analog products. Warren Bickley graduated from Texas A&M University in May of 2005 from the Industrial Distribution Program. Warren lives in Dallas, Texas and, along with Tom, is an Account Manager for TTI, Inc.
NEDA is a not-for-profit trade association representing distributors of electronic components and their manufacturer-suppliers. Dedicated to the enhancement of the distributor-manufacturer relationship. NEDA represents companies involved in the distribution of electronic components and parts, computer and computer peripheral components and test, measurement and control equipment and their manufacturer-suppliers. Based in Phoenix, Arizona, CorePurpose Publishing supports authors in the business, academic, and non-profit sectors in producing specialty titles for their target marketplace. Posted in Company News, Industry News, News, Publishing and tagged Electronics Industry, Electronics Primer, Semiconductor INdustry.